Indiana's all-time leading jockey, Rodney Prescott, earned his third leading jockey title at Indiana Grand Wednesday, Nov. 7. The Portland, Ind. native was awarded the title after winning his 114th race of the meet in the first race aboard the Kim Hammond-trained Desert Thief. McGovern picked up Prescott's book for the first time in Indiana this season. The title with Prescott is her first as an agent. It also marks a first for a female jock's agent to win a title in the 23-year history of racing in the state of Indiana. Prescott wasn't sure how many of those particular horses he was on for the win, but noted that he's been on several of them. He noted it's people like Ellie that work behind the scenes that makes it possible for jockeys to win races, and he expressed his gratitude toward her and other caretakers at Indiana Grand. 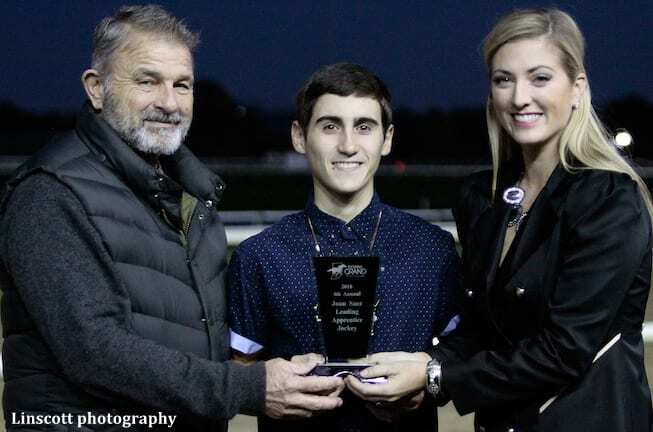 Although he had limited starts at Indiana Grand this season, Edgar Morales accumulated enough wins to be named the Juan Saez Leading Apprentice Rider for 2018. Morales, a native of Puerto Rico, adds the honor to an already impressive resume, also earning leading apprentice rider titles at Oaklawn Park and Ellis Park earlier this year. Morales completed the meet with 10 wins in 76 starts and more than $380,000 in purses. He spent most of his time on the Kentucky circuit throughout the season, but would make frequent trips to Indiana to ride, piecing together an impressive season for the award. Morales earned his first win last fall at Keeneland. He now has 89 career wins in 915 starts with over $3 million in career earnings. 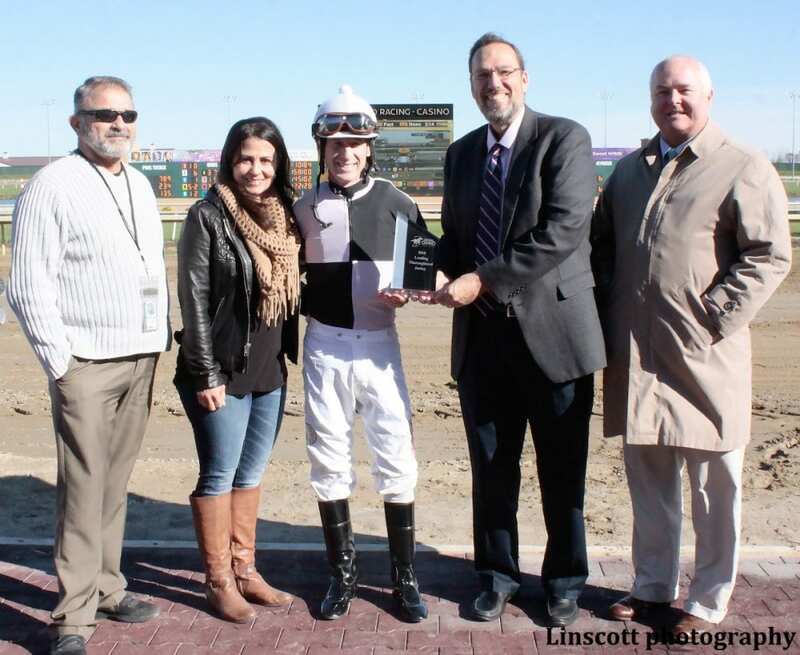 Rachel McLaughlin, on-air racing analyst, and Steve Cahill, clerk of scales, made the presentation to Morales. The award is named after Juan Saez who perished in a racing incident at Indiana Grand in 2014. Saez was honored posthumously with the leading apprentice award that season and subsequently, the award now carries his name. Morales joins jockeys Cheyanna Patrick (2015), Eduardo Gallardo (2016) and Katie Clawson (2017) as recipients of the Juan Saez Leading Apprentice Jockey award. This entry was posted in People and tagged Indiana Grand, Kim Hammond, rodney prescott, shannon mcgovern by Press Release. Bookmark the permalink.